Some years ago, my husband reconnected with a school-friend he had not seen in decades. As both of them are artists, they had a lot to talk about and so we invited her to visit us. Marietha Smit turned up with a roll of black paper under her arm. We had to move the furniture from our living room in order to view her work. 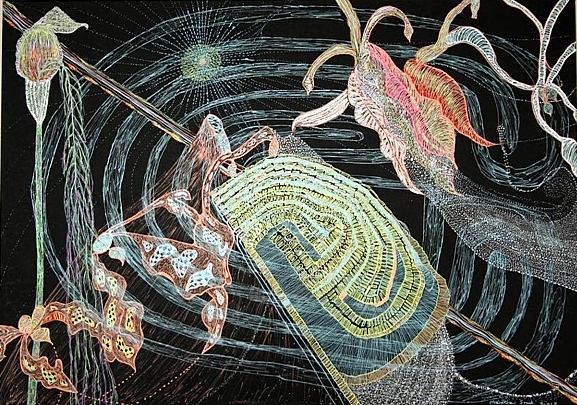 The above is a detail of Peeling IV, which forms a part of a series of five works from 2006 which she showed us. The series is called Peeling the Onion. The average size of each is 3 x 2 m – making a staggering total of 30 square meters of paper covered with areas of tiny writing in between fine-line drawing in coloured pen. I felt overwhelmed. How to take this in? How to react? Do I get down on the floor and crawl across the work and try to decipher the writing, which surely must be important to the meaning of the whole? Or do I just look at each huge sheet and try to glean something through half-closed eyes? “It’s a mind map in which I am trying to understand all kinds of things about myself and my life and the world in which we live,” Marietha said. She told us about her youth, when her father’s career as a diplomat led to frequent relocations and disruptions of the family’s life and, for her, a sense of alienation. She returned, alone, to her home country to start her university education, where her mental and emotional turmoil led to a breakdown and a stay in a sanatorium. A fellow inmate gave her a copy of H.R. Rookmaaker’s Modern Art and the Death of a Culture, which played a role in her recovery and led to her becoming a Christian. before finding the first thread of my red robe. Of my own self I see a faint glimmer. in search of other boundless hearts. Dream Flowers is an illustration of a dream of “walking happily among beautiful flowers and very many stars.” The artist has here entered a poetic space, the space of her true self, her soul, where God dwells. She can walk the labyrinth and find direction, at home with her Heavenly Father. “Seek ye first the Kingdom of God,” Jesus said. He also said “The Kingdom of God is within you.” Let us get to work and ‘peel the onion’. 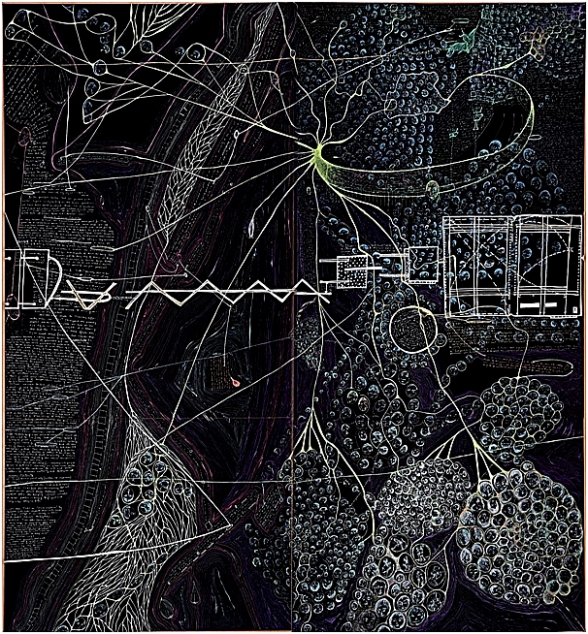 Marietha Smit: Peeling IV, 2006, coloured pens on black paper, 2 x 2.1 m.
Marietha Smit: Dream Flowers, 2013, coloured pens on black paper. 60 x 42 cm. Marietha Smit is a South-African artist who lives in Johannesburg and works full-time as a high school art teacher. In between teaching she obtained a Masters degree in Fine Art from the University of the Witwatersrand, Johannesburg, South Africa. She also has a Maitrise de Lettres Modernes from the Université de Paris III La Sorbonne Nouvelle in Paris, France. Currently she would like to produce a PhD Visual Autobiography (Fine Art) project that she describes as “basically telling the story of how Jesus Christ saved me, how I was reborn, and how healing, growth and victory have been the hallmark of my life since 1977 and are still happening today.” Do visit her website, www.mariethasmitart.co.za, if you have been touched by her story and connect with her. She’d love to hear from you. Erna Buber-deVilliers is a retired South-African high school art teacher who enjoys writing and many other leisure pursuits. Gert Swart was born in 1952 in Durban, Natal, South Africa. He has worked as a sculptor in Pietermaritzburg, South Africa, for the past 25 years. See his work on http://gertswartsculptor.homestead.com/. The poem by Edith Södergran is included with permission by the publisher. It appears in Poems by Edith Södergran, translated by Gounil Brown, ISBN 0-9511069-5-3, Zena Publications Ltd, 1990.